It’s that time again when it’s a slow news day and mobile phone vendors set off on a troll moment. We’ve been served with several previously. I am sure you remember the infamous LG troll of iPhones and Samsung Galaxy, and the comeback by Samsung fans. Nokia also had some news for Apple, LG with bad words for Blackberry and some that went nasty between HTC and Samsung. 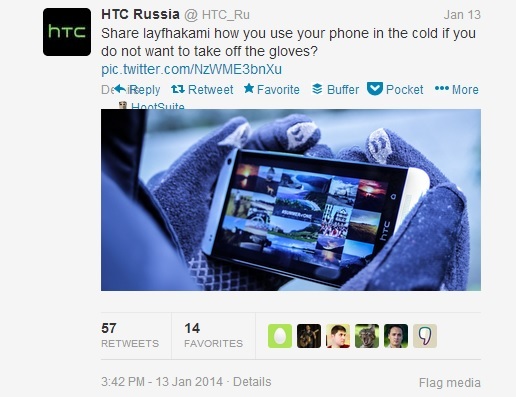 Now HTC in Russia in the usual social media engagement asked their followers what tricks they use when it’s so cold and they needed to use their phone. Nokia Russia was quick to jump on it and respond with a convincing troll message of a Nokia image with a user having gloves on, comfortably using the phone. We know Nokia is known for hands in glove use in their smartphone, a technology that was introduced sometime far back. Doesn’t mean much to us in the tropics, but it does up north like right now when the winter has hit hard. The Nokia troll was a hard hit as they even included part of the HTC tag that is Quietly Brilliant by responding with “quietly enjoy”. There is usually a third party troll once in a while who missed the moment to impress but still cant let that pass. This third part troll was Huawei in this case witha me too response. It’s great that that friendly banter managed to end without casualties, but that was a moment of awakening when industry rivals have a technology that’s useful and you don’t have. This means that HTC could not get a comeback for this, no matter how hard they tried. Maybe next time.